Over 4,200 photographs were submitted to this year’s Insight Investment Astronomy Photographer of the Year contest, but only these 25 images made it to the shortlist. This annual competition, organized by the Royal Observatory Greenwich, is now in its tenth year. Shortlisted entries from this year include a wide variety of subjects, from the sprawling Milky Way and storms on Saturn through to glacial tongues and the Northern Lights. If it’s got something to do with space, it’s all good. This year’s contest features nine different categories, and two special prizes. The winners will be announced on October 23, 2018. Photographer Avani Soares stacked 4,000 frames to create these stunning images of Saturn, our Solar System’s second largest planet. Sunspot AR2665 was a very active region in 2017, as demonstrated by this particularly impressive quiescent prominence—a glowing looped material of plasma—extending out from the Sun. A stunning photo of the Northern Lights taken near the village of of Teriberka in the Murmansk Oblast district of Russia. The magnificent Milky Way, as seen in Cable Bay near Nelson, New Zealand. Battling light pollution in Malibu, California, photographer Brandon Yoshizawa managed to frame the Milky Way galaxy inside a sea cave, 25 miles away from the heart of downtown Los Angeles. Our moon never looked as colorful as it does in this stunning photo captured by Nicolas Lefaudeux. A glorious daytime pic of the Moon—you can almost reach out and touch it. Photographer Helen Schofield captured this image in Malaga, Spain while vacationing with her children. The remarkable underbelly of the Breiðamerkurjökull glacial tongue in Iceland. During a solar eclipse, the brightness of the solar corona obscures the Moon’s finer details. More like unreal. A flared up aurora as seen near Christchurch, New Zealand. Photographer Jingpeng Liu captured this exquisite shot of our galaxy in Badlands National Park, South Dakota. This panoramic view is a six-shot composite: three for the sky and three for the foreground. Oooh, spooky Moon. With help from his grandfather, and a new telescope he got for his birthday, photographer Casper Kentish took this photo with an iPad. A panoramic image composed out of eight photos, showing the Milky Way emerging over the rocky Dolomites in Tre Crime, as seen on the left. A super-impressive shot from Inyo National Forest near the White Mountains in California. This image was taken as thunderstorms threatened the Eastern Sierras, leaving little time for long exposures. A weathered juniper tree grows in Montana’s northern Rocky Mountains. The arced star trails in this long-exposure shot rotate around Polaris, the brightest star in the constellation of Ursa Minor. The Northern Lights reflect shades of green and yellow on the snow, as seen from a tiny cave on Lake Torneträsk, in Swedish Lapland. The Aurora Borealis bursting through the clouds and looming over the mountains in Stokknes, Iceland. The pools of water between the dunes are from melted snow, creating a perfect foreground. The Orion Nebula (also known as Messier 42, M42, or NGC 1976) is a diffuse nebula situated in the Milky Way, south of Orion’s Belt in the constellation of Orion. Located 1,270 light-years away, it’s one of the brightest nebulae (a star-forming region) in the night sky, and is visible with the naked eye on a clear night. Wow. The vivid blues in this nebulae, located in the Corona Australis constellation, are stunning. The blue color is produced by the light of hot stars, and reflected by silica-based cosmic dust. The Witch Head Nebula and Rigel, as seen from the Republic of Namibia in southern Africa. 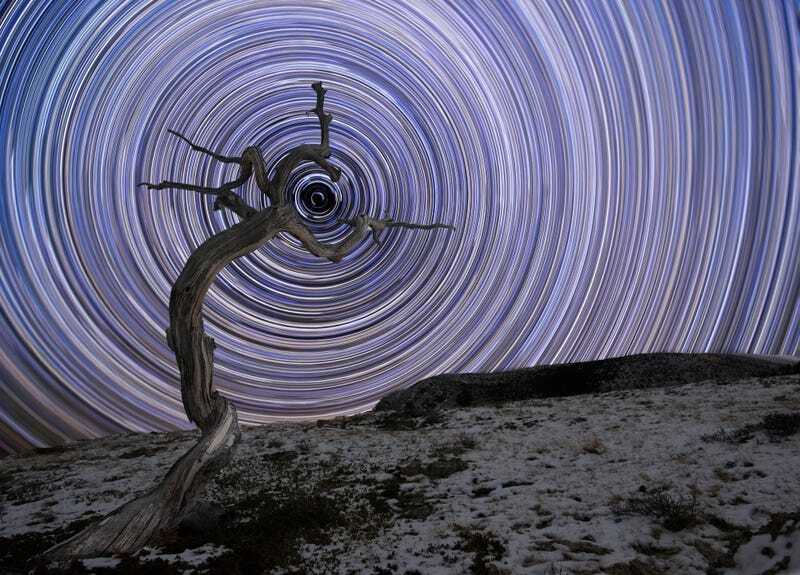 Star trails sweep over colourful and extraordinary sacred altars, called Ovoo, in Mingantu in Inner Mongolia. A shot of the Eagle Nebula, also known as Messier 16, taken at the Baerenstein Observatory in Germany. The great Horsehead nebula appears to be looking down at the often ignored Nebula NGC 2023. The Orion Nebula, located 1,500 light-years away. For you photo geeks, this stunning image was produced by combining 36 hours of total exposure using six different filters; Ha, SII, OIII, Red, Green, and Blue. Stars loom over a thunderstorm in Florida.